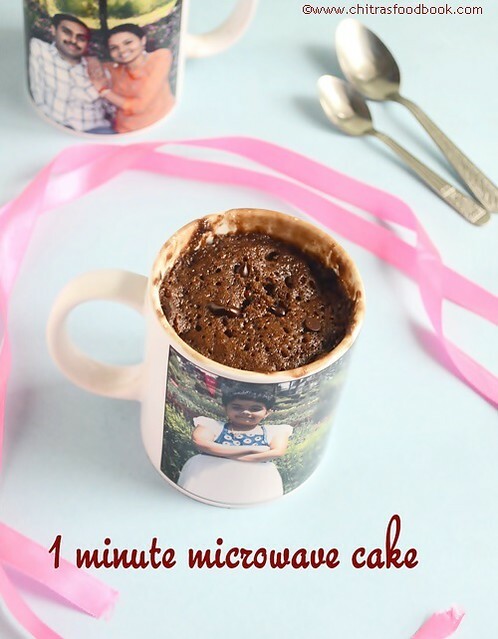 Eggless one minute chocolate mug cake in microwave - Very easy n super tasty cake!! In a mug,take all the dry ingredients.Mix well.Then add oil,milk & essence.Mix thoroughly without lumps & sugar should dissolve completely.Check for taste and add more sugar if needed. Microwave in 800w power for 1 minute.Cake will raise to the top and it may deflate.Check with a tooth pick.If it comes out clean,ur cake is ready.Else keep it for another 10-20 seconds.Mine took 1 minute 20 seconds. After taking out,studd in few choco chips & enjoy !!. Adjust sugar as per the taste of cocoa powder else it may taste slightly bitter. As it is an instant cake, serve immediately when warm. As given in the original recipe,u can add a tbsp of nutella,peanut butter or jam.In that case,reduce the sugar to 1.5 tsp and adjust the chocolate powder to 1 tsp. I used canola oil.U can replace with olive oil or any cooking oil. Make sure u mix the batter well without lumps. 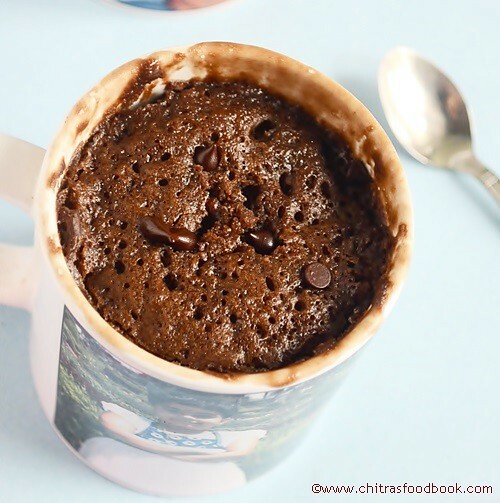 One minute eggless chocolate mug cake is ready to enjoy with super soft texture and taste ! 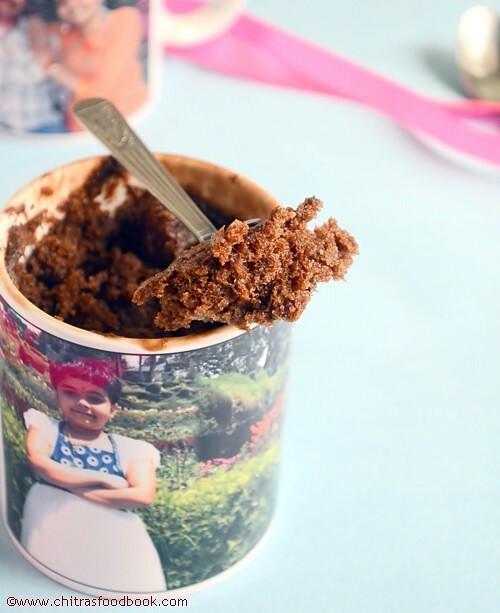 cute little angel.. loved the way she has posed for the photo with confidence.. and cake looks super yumm..
Love that personlized mugs, this one minute cake is my all time favourite. She is looking adorable ........ Mug cake looks delicious ! I love that this is an egg less cake. I am bookmarking this! 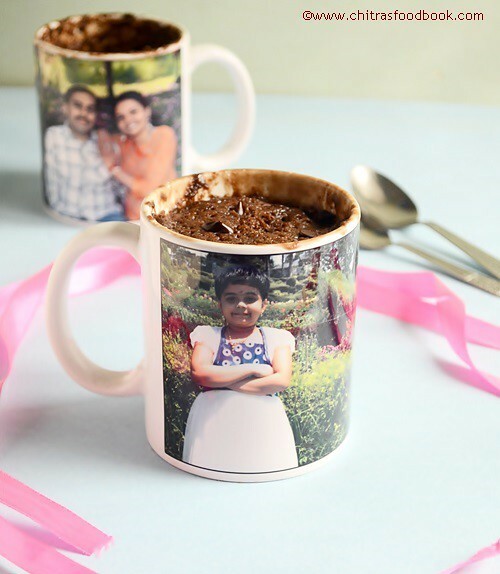 I am sure this post made your daughter very happy....love the idea of serving in personalized mugs. If I don't have chocolate chips, should I increase the sugar or cocoa? Choc chips is optional.U don't have to increase cocoa powder.Just adjust sugar if u need more by checking ths taste before baking ! Thanks ! I tried your mug cake and it came out so good. I had tried this cake with other recipes but didnt get a good result but this time it's a great success. Thanks a lot for the recipe. next I will try your oreo cake. My son loves oreo biscuits..
Hi Chitra.. really thanks for all your recipes. I have been trying many of your recipes and it comes out really well.. But this cake.. when i tried for the first time it was good.. But second time it turned out to be more bitter.. the ratios were correct but not sure what went wrong. Any idea on what could it be? Thanks for your sweet words Arulpriya :) There are very less chances for this cake getting bitter.It could be the quantity of sugar is less or due to cocoa powder.Did u taste the batter after mixing ? Thanks Chitra for your reply :) Next time I will taste the batter before cooking. Does the microwave have to be the convection type? Hi dear . Liked the information about mil lets . I was aware about ragi . Can u help with any recipe with ragi for my 9 month old baby. . Today I tried ur quick eggless brownie it was amazing but it remained uncooked from bottom . Can u point where I went wrong. Any ways best wishes as u r doing a good job. 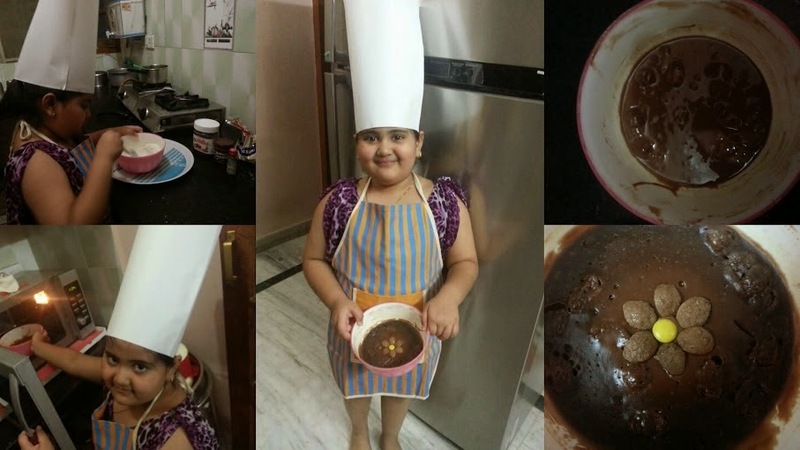 Hi Chitra, I tried this cake and it turned out wonderful. Thanks for sharing. Hi... Thank u so much for these amazing recipes. . I tried ur one min brownie. . Oreo cake.. all turned out to b perfect.. my family members loved it... i loved it too.. nxt am gonna try ts one.. nd the orange cake. .. Thanks a lot for the feedback. U will get great results for other cakes too. :) All the best ! Tried it and it came out very nice so thank you for this yummy 1min recipe!! Awesome recipe! Can we use butter instead of oil?